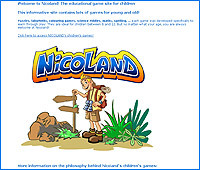 The games on Nicoland were developed to allow children to learn through play on the Internet. While playing, they practice spelling, conjugations, sums and they discover maths, science, history and geography. The site even contains exercises to learn French! Each exercise in Nicoland belongs to a specific category: 6 to 8 years, 8 to 10 years and 10 to 12 years.